Well it was love at first sight when I sat on my C50. Comfort was a consideration since I knew I'd be hitting the roads (heading Cinci to Toronto next month)and have ridden 9,000 miles plus in the past year! 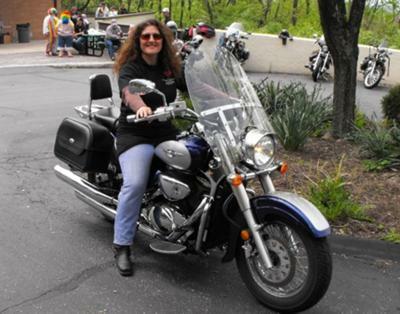 I also like the big bike look in a manageable bike for a gal of 5'3". If you like chrome, you'll love the look of this bike. I have added on radiator grill cover, highway bars, sissy bar and luggage rack since purchasing and it looks even sharper. I'm confident to ride a bike that is dependable, very low maintenance with shaft drive and liquid cooled, steady at high speeds and very maneuverable on curves and corners. I'm able to change my own oil easily and have been enjoying learning to use new tools! Now feels like an extension of myself when I ride.. this is a long term committed relationship. I really like that bike! It looks tough! Have a safe summer on it! That's a nice-lookin' ride and you make it look even better! Congrats on your 9,000 miles in a year. I've put on over 8,000 in 15 months so I understand what your bike means to ya. Love the look of your new bike. Just purchased an '09 C50 SE and am riding again after a lapse of 24 years. My son just purchased an M109R so now we will fulfill a long-standing promise to tour together. Very nice bike and Congrats on the "Bike of the Month"
I have had my red and white C50T for a year and love it..very comfortable bike. I added highway bars luggage rack and new pipes. Here in Houston you want people to hear you coming It needed to be a little louder. Enjoy your ride and be careful.. I have an M50 and I love it as well. Your C50 is nice, and I like your upgrades!